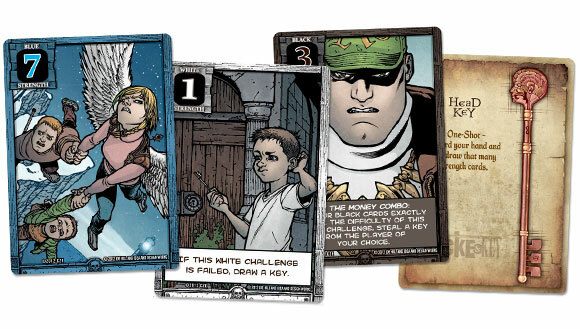 Based on an award winning graphic novel, Locke & Key: The Game is a cooperative card game with a competitive twist. Locke & Key: The Game is an interactive card game based off the Eisener winning graphic novel by Joe Hill. This dark fantasy novel about Keyhouse, a mysterious mansion in Lovecraft, Massachusetts, is filled with creepy characters and spooky keys with supernatural powers. No prior knowledge of the story is necessary to play the game but if you have read the series you will probably enjoy the game much more since the thematic components in game will have more meaning. The game comes with 184 cards total, a large initiative token, and the customary Cryptozoic cardboard standee. There are several types of cards in the game, key cards, strength cards, and challenge cards. The physical card stock feels standard and the print quality is very nice. Cards have illustrations from the graphic novel which may seem quite strange for those unfamiliar with the story. If you’re a fan of comic book artist Gabriel Rodriguez you won’t be disappointed as most of the card’s real estate is dedicated to his work. The key cards are what shine in this game — literally. Each is covered with a luminescent foil and grant the wielder special abilities (that part is not literal, durp). Cryptozoic did a great job designing the key cards to look and feel special. The game mechanics in Locke & Key are interesting and have a semi-cooperative element. Players will be using their resources (strength cards) to cooperatively defeat challenges in competitive fashion. The gameplay is interactive but not in a ‘take-that’ kind of way. It is a game of deciphering what other players are up to and positioning yourself to reap the max reward. Some players may try and team up while others will take on challenges solo. Each player will have a starting hand of strength cards. Strength cards come in 3 colors and have a number that indicates their strength. Some of the strength cards have additional abilities that could potentially come into play. At the start of a round a challenge card is overturned. To beat the challenge players must collectively commit strength cards of the same color to the strength. This is sort of like battling one of the bosses in Defenders of the Realm but with some key differences. The amount of strength each player contributes to a challenge is a secret, which adds a bluffing element and players will be looking at each other suspiciously. Players will be kept on edge until everyone reveals their cards. The key cards players acquire will allow them to do special actions during their turn or after all cards have been revealed. For example, adding more strength to your play, changing the color of a strength card so you can use it towards the challenge, and other actions that add more fun and unpredictability to the game. Only one person will actually win the victory points for defeating the challenge but there is also a second place reward. With that said, the game experience is very different depending on the number of players. With three players challenges are more difficult to overcome but with less competition rewards like key cards are easier to earn. More players isn’t necessarily better, it’s just different. The themes of the graphic novel may not be suited for young children and the artwork is taken directly from the comic book. If you are playing with teenagers, this game is worth checking out. The rules are simple, the game plays quickly and being both cooperative and competitive at the same time is a fun twist for a card game. Locke & Key is easy to learn and provides a unique type of interaction not typically found in card games. Strategy gamers will have the tendency to just read the card directions and skip all the flavor text and interaction. If you’re looking for a new card game with a bit of a twist, this has been well liked among the casual gamers we’ve played with, even if they knew nothing about the graphic novels. If you are a fan of the Locke & Key series and are looking for a easy to learn game with quick play times, definitely check this out. Just note that it is not a 2 player game. The cool artwork and special key cards will attract any non-gaming friends who like reading graphic novels. Some Power Gamers may find that this game needs more complexity. For example, there is no repercussion for loosing a challenge, which may bother some Power Gamers. Locke & Key is very different from most card games that usually involve punishing other players and keeping them down. The cooperative element of this game and the really cool key cards make this game unique, and yet competitive. Because Locke & Key: The Game has a cool theme and can be learned quickly, this game will have a lot of appeal to comic book fans who are new to gaming. It is a fun and attractive card game with a bit of a twist, fans and newcomers to the series will not be disappointed. Overview: Locke & Key: The Game is based on the comic book series by Joe Hill and Gabriel Rodriguez. The basic concept of the game is to acquire strengths and talents of the Locke family to overcome challenges that they face at Lovecraft, a haunted mansion that they inherit. Players do this by playing cards, based on these family abilities, to overcome the challenges that are revealed throughout the game. The player who contributes most to prevailing over the challenge receives the most victory points. Locke & Key: The Game is a semi-cooperative game, which means it is also a semi-competitive game. In this game, as in most, competitive strategies and effort far outweigh cooperative ones (players are not one, big, happy family). Components: The game contents are quite simple, including 184 cards (standard size, measuring 63mm x 88mm), a cardboard “First Player” lock token, rules booklet, and cardboard game standee (typical with Cryptozoic games). The cards are well-made, with amazing illustrations contributed by Rodriguez himself. The 15 holographic key cards are especially notable for their beauty and uniqueness. Gameplay: Each round a player will turn over a challenge card. Each challenge has a particular color and level. Players can then play any number of strength cards from their hand facedown in a “cooperative” attempt to defeat the challenge. If the total strength of the challenge-color cards played by all players is higher than the strength of the challenge card, then the challenge is defeated. The player who contributes the most points will win the challenge card, its strength becoming victory points for that player. The second highest contributor will also earn victory points. Key cards can be added by players to augment the results of the strength cards played in that round. Some strength cards have special abilities that can affect scoring. On subsequent rounds, players will turn over a new challenge card and the process is repeated. Game ends when the “Game Over” card is revealed. Victory points are then totaled. Impression: Although game play seems quite simple, strategy plays a major role in this game. Facedown cards could be bluffing by some players to force out cards from others. Some cards will allow stealing or trading of valuable key cards. Even determining play order can affect the outcome of a game. Games tend to be of short duration and do not require much explanation for new players. Although the art work is amazing, I wish that there was more variation in the illustrations rather than many cards of the same strength with the same artwork. The game concept is quite simple, but special effects on cards can turn a game around. Generally, this is a good, quick game that is very visually pleasing. Even thou there isn’ t much “story” involved in playing this game, the cards themselves add to the enjoyment of this quick playing game. The game is fairly simple to teach others how to play. Players don’t have to know anything about the books to enjoy the game, but the artwork of the cards will probably make them curious about the story. Gameplay is cooperative and competitive at the same time, thou the more players you have the more competitive the game will play out. One of the quicker games I’ve played, but replay is good if people like it. The only thing about the game I’m not a huge fan of is the lack of consequence for failing to complete challenges, but this fixes itself when there are at least 4 players. That’s when the competitiveness makes it so players don’t have to cooperate somuch to comolete challenges. There is nothing really new in the mechanisms, but they are nicely combined. You try to gain keys by paying cards or try to create the strongest combo of cards(or pretend to do so) against the current challenge. The keys give you in game bonuses that may help. The weakness of the game is that 1 or more players can decide to play to thwart a particular player. Those players won’t succeed every time of course but it does take some of the fun away. Add a Review for "Locke & Key: The Game"